I stayed in the area and used zero petrolAte cheap, simple to prepare food: rice and vegetable frittata; risotto; popcorn; home made coffee; herbal tea.Rugged up and went walking in chilly temperatures when I felt a dose of cabin fever.Quick clean and tidy up.Made a small batch of rose petal and apple jam.Decorated jam jars with pretty paper instead of buying labels.Extra risotto ready for tomorrow's brunch.Hot water bottle on my back helps with pain and any discomfort.Researched more property and their unique details.Went through catalogs and selected weekly specials of staples.Made little tubs of frozen yogurt and homemade jam for a ice cream substitute.Added to my shopping list.Watered pot plants.Put on load of washing.Folded up load of washing that dried inside while it poured and stormed outside. This one is very recent, a massive up take in families walking together. Cheap recreation. Last two weeks this has noticably and dramatically increased.Easier to get parking and fewer shoppers in major shopping centres.Regional shops with national brands shutting down.Popular stores staying in area but downsizing store.For lease signs outside business premises.Reduction in housing prices.Bank sales increasing.Reduced spending in cafes.Land for sale in some areas, was $40 k, now "negotiatible".Rural property and outskirts getting cheaper, some markets have peaked. One area similar house sold for 270k six months ago, better house with waterview a couple of kms away now 190k. I just realised this is month two off BCP and thyroid medication. I am coping much better than last month. My weight is in the healthy range but is still a little heavy for my frame. My premenstrual nausea was a few hours and relatively mild. My appetite has at times been low but that probably has to do with eating a little late in the day from time to time. I am eating enough calories. Cramping is pretty low pain and rare, and this is the best cycle I have ever had so far ( days in). I am still taking a reasonable dose of loguls iodine, 2 drops per day diluted in water on average, up to 6. Still taking multivitamin, a zinc and iron tablet occasionally and B12 to deal with chronic anemia and B12 deficiencies due to Coeliac. Taking selenium to help manage thyroid disease. Occasionally taking a adrenal extract to help manage chronic fatigue. 1. by mending my top by hand neatly. Loving it mended. 2. Drinking cheap, hot drinks. I recommend peppermint tea. Even cheaper if you use peppermint from your garden. 3. Made a preserve from red wine, lemon juice,carrot, Apple and sugar. Good for sweet or sour dishes. 4. Reading borrowed books and watching freely broadcast movies for cheap entertainment. 5. Started another shopping list for next shop. 6. Added fresh rose petals to black tea for a twist. Today, to save for the beach shack:1. Found another place to talk to an agent tomorrow. So far, my research does not show major issues. Today I am grateful that:🐶 I am safe and have the company of people and animals. I fear a friendly spider has moved in, but if it stays living in the sliding door gap, it will likely have a good life expectancy. Lizards are gently, and swiftly, shown the garden! 🤕 I might have been quite unwell lately but it is not life threatening and I am managing to be reasonably productive. I am grateful I can rest. 🌿 I am grateful for gardens to enjoy even if they are not mine. 🍏 I am grateful for simple healthy food. Today, I was especially grateful for leftovers that I could easily prepare as I went out to do some errands and was exhausted when I came back. I wrote an article a few days ago about the loss in many quarters of the presumption of innocence and the flagrant irresponsibility of people who base decisions solely on feelings. While I stand by my comment that there are consequences to pulling someone's reputation through the mud, that those people may not care when life gives people lemons for their stupid actions, I do believe in looking after people truely in need. It has taken over six years of asking and I finally have pictures on my bedroom walls. In retrospect I should have just put them up myself but I do not like to make changes to a house that is not mine. Today, I also added some everlasting leeks to my container garden and in my parent's vegetable patch. I really should grow potatoes next and then I have the ingredients for a very frugal soup! I found, and organised a viewing of, a house I hope will be affordable given its age, condition and the headlines of more bankruptcies along with tightening lending. There seems to an insidious movement in Australian, perhaps western society broadly, with the erosion of the basic tenant of strong democracy which is the presumption of innocence, or more commonly known as innocent until proven guilty. Not only are feelings being weighed in the place of facts, they are now weighed greater. Where feelings are the only information that decisions are based on there will always be long term negative consequences. Then those that take responsibility and look at facts, listen to intuition but find facts to support it, are left to pick up the pieces from people who unnecessarily place themselves and others in danger. In certain parts of rural Tasmania buyers are offering far below seller expectations for older properties with wear and tear and traditionally affordable area's blocks. Real estate agents are telling me that sellers will have to discount severely to sell in some of these locals because those with the ability to buy are watching their budgets. Mortgages are also becoming difficult to impossible to get for houses with tenants in and where investment is the point of purchase. Reportedly mortgages in general are harder to get in some areas in Tasmania particularly with the big four banks. On occasion, much to my utter indignation, words amounting to my life being easy and glamorous due to my single status, working and being man free have been lobbed my way. Firstly, before I write the following, I am not bitter because I do not have children as I know it is not a walk in the park. I am glad when I see happy families full of laughter and tantrums (and that's just the adults). Also, I believe family's should be provided with reasonable support, as should everyone who needs it in a civil society. There are record rainfalls forecast for much of my state. Thankfully, where I am we are just likely to get enough rain for a duck who feels like a walk but not enough to cause too much fuss. In the north and east of the state the emergency services are on red hot alert. I do hope they can stay inside and drink hot beverages and everyone stays safe. In the meantime, while the clouds are grey and they think about doing more than spitting rain at me in contempt, I have the home fire burning cheerily and I am onto my second cup of coffee. As I type, one saucepan is bubbling away into chicken stock and another is the beginnings of vegetable with perhaps chicken soup. It just depends how it evolves and how the thing tastes. Australian Big Four Banks, no longer big on interest only loans. I just wrote the previous blog post detailing the Australian bank, The Commonwealth Bank of Australia, using measures to reduce their loan book of interest only loans. Reportedly, due to the limit being placed on these kind of loans ANZ has taken their own strategy to meet the regulator's requirements. According to this article below, ANZ will be limiting interest only loans to periods of five years, instead of the previous ten years, waive a fee for those moving from interest only to principal and interest, and apply a fee to those not occupying interest only properties. Interest only, low deposit loans going way of dodo? One of the major players in Australian banking, The Commonwealth Bank, has reportedly announced tougher requirements for those looking for an interest only loan. At this point it seems to be directed at new customers but will likely have implications for those looking to hit the construction phase soon. Felt like a pumpkin pie type dessert yesterday so I mixed up plain pumpkin puree I made, Greek yogurt, a little honey, cinnamon and nutmeg and placed in little containers before freezing. At the amounts of honey I used it certainly was not decadent but still made a light and enjoyable snack. It was dense when frozen. This could be enjoyed defrosted instead of pumpkin pie. Adding marmalade would be an addition that would be delightful. I actually do not know that anyone made this during The Great Depression but I do know that these are the ideas born of either determined frugality, or forced food stretching. The only bit of the pumpkin I threw out was the stem. With a compost bowl and lid started so I can throw things there in the dark, I will waste nothing. I cut my free pumpkin, that my Mum cultivated in her garden, in to pieces. It was a little grey pumpkin full of flavour. Added olive oil, rosemary picked fresh out the back door, salt and pepper and roasted. After the pumpkin cooled I placed the pieces in a container in the fridge to deal with later. Today, thanks to The Head Gardener I added turnip seedlings to my container garden just before the sun went down. It is the perfect weather for Christmas pudding and hot chocolate. Thankfully, the weather is also chilled enough for potato, leek and free bacon soup. I was going to make the soup minus bacon but the head gardener offered bacon so I added that to my food offering. I do love bacon in leek and potatoe soup. As it was, being inspired to make soup with potatoe worked out very well as my eked out spuds were quietly beginning to go off. Soup was dinner last night with a couple of portions of leftovers. Now I am well on my way to making a frugal meat and vegetable pie which will be topped with roasted pumpkin purée and gluten free flour. The only flaw in frugal cooking are the dishes I create sometimes! Still, leftovers in the freezer make for easy meals at low expense in the future! My onion jam worked out wonderfully, well worth trying to make. Today, in what I can only imagine was a moment of frugal inspiration I managed to make what appeared to be a potential new generation antibiotic and curdled off milk. I was aiming for beautiful greek style yogurt. If you have even a cursory understanding of food safety you will be relieved to discover that my mistaken yogurt was thrown out. I've been managing to make yogurt for a few weeks from yogurt and milk. I do not know what has been going on but the last couple of times I have tried to make yogurt it has been an unmitigated disaster. Buying a bit more yogurt certainly will not hurt my bottom line after making it from scratch for a few weeks! As I type, I have onion and apple jam brewing on the stove top and basic oat cakes that will make up my dinner with chicken leftovers. In the freezer is gravy and chicken left over from a roast and a carcass from a roast ready for soup making. Yesterday afternoon I could feel, despite plenty of rest, that my body was going to do a pretty full on chronic fatigue crash. I managed to do a couple of small jobs before collapsing on sofa and falling asleep for a few hours. After an hour or two of that, I went to bed and slept until late this morning other than getting up early to attend to animals. So when I finally opened the newspaper and saw the headlines, I was bemused to see that today is some kind of world chronic fatigue day. Yes, I am yet to read the article properly but you must admit there is a certain amount of irony involved in all that! I would write my own piece on how parents will be affected by the 2017 Budget but why reinvent the wheel? Also shows that the government will be spending more on seniors to help with services like Meals on Wheels funding. Just briefly though, more childcare provided to parents and cutting family tax benefits to higher income earners with it beginning to decrease at 94 000, with the taper rate increased to 30 cents in the dollar. Given Newstart (unemployment benefits) and student payments cut out completely after weeks on minimum wage, I think this is still a reasonably generous move, though it will probably annoy quite a few people that were budgeting for it staying. With the Australian Federal budget about to be released, and fruit prices likely to increase due to cyclone damage, now is the time to look to the past to save present pennies! 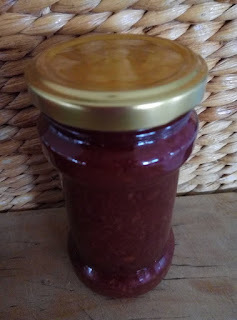 Like many, I live in hope of sense in the budget but am bracing for the worst and putting away some jam. Today, I watched the Federal Treasurer, Scott Morrison's budget speech to parliament. As expected from a geek such as I, I made notes. Then, when my mum popped by I delivered an impressive missive on the main points in the budget. I am still in shock at what seems from first glance to be an intelligent, well thought out, overwhelmingly fair budget. Yes, there are things people will not like but this is the smartest budget I can think of in a couple of decades, if not longer. I was going to spend time reading budget documents before I commented but there were more important people to attend to, so it can wait. 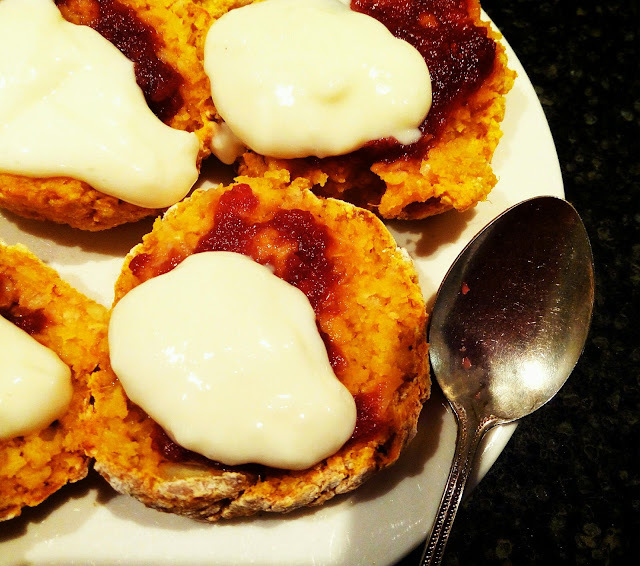 Gluten free, wholegrain, pumpkin dairy free scones with homemade jam and mock cream. This mock cream was made with about a tablespoon of gluten free flour, half tbsp of butter, half cup of lactose free milk and two teaspoons of raw sugar. Mix flour and butter together over heat, add sugar to saucepan and then slowly whisk in milk. So good with butter and low lactose. I accidentally stumbled across a recipe for a mock raspberry jam from the ingredients I had on hand. It comes out a lovely jewel tone with just a hint of rose. I washed, diced and added everything except the sugar to a saucepan and simmered until soft. Then I whizzed the mix up with a stick blender while keeping some texture (reminiscent of raspberry jam texture). If you had no, to low, electricity you could use a non electric food strainer. Then I added the sugar and brought to a gentle boil, constantly stirring, until set (a few minutes). Embrace your inner bright smiling sun kissed hippie! For the last twelve months or so, I have been using a commercial remineralizing tooth paste which along with some dairy consumption and iodine supplementation reduced my need for fillings by two. Unfortunately, there was nothing the dentist could do for my baby tooth that had no adult coming after it. Having a body that did not absorb nutrients for a prolonged time is not great for teeth (Coeliac). Tea drinking can also help keep teeth strong too. In one of my more DIY moods, I thought about making my own remineralizing tooth paste but I'm not sure I can be doing with all that. If you can, perhaps these articles may interest you. I'm not sure that they work though or are safe so I am not recommending this. You would have to talk to your dentist/ pharmacist for advice. I'm not quite feeling at my most fabulous due to a bit of cold virus. At this point, I am interested in minimum work, maximum nutrition, edible, dinner. This approach is not about to become a leading program on any television network but it's an easy way to get to eat. Tonight, I placed some raw basmati rice, some mince, pumpkin soup, vegetables I chopped up, soy and chilli sauces and let simmer in the oven in a pyrex dish until cooked. Given the cool autumn weather and my current aversion to dishes, this really was an easy, tasty budget meal. I'm not sure I would get away with this level of cooking with anyone else but it's nice to take it easy sometimes and not worry about frills. I guess you could chop up some greens and pretty it up but I was too tired. The other good thing about this approach is that it's an easy way to use up groceries and avoid supermarkets! Sharing a fascinating case study of Japan about why continued intervention by government to prop up a country beset by asset price bubbles does not work. According to Austrian economic theory, it is better to let things get bad, sell off bad debts, and start again. This is the idea that I have often argued for and Australia desperately needs from our leaders. I hold onto hope the size of a mustard seed that this budget might allow us to go into recession and rebuild the country so that hard work and good stewardship is rewarded. That would be a politically courageous and difficult thing for any government to do. Continuing as we have is sending us into recession the political leaders and mortgage holders do not want. Banks are already there with mortgagee sales popping up faster and quietly if you know where to look. The stuff has not hit the headlines. Better to be honest and act now and let things be bad in the short term for the good of the people in the long term. With great passion comes little responsibility? I did have a fabulous opening line, to be typed here, before this computer had a fit again. For some reason Internet Explorer can not cope with me doing web based email at the moment. After a good shout at the computer, the line has gone from my head. Here is hoping it is to do with browser I used. Now I am trying Chrome which can also be slow but is currently behaving itself. As a general rule, I do not give out free business advice to anyone. My mum is an exception, and it's not really free, because she is always doing something for me. I just spoke with The Head Gardener (my mum) and she was not thrilled that my inspired marketing advice involved work. The Head Gardener hung up after an amiable groan at me on the phone. Went through my grocery stock last night and cleaned up. Set myself the challenge of using some older bits and bobs so I do not waste money. Think of it as frugal version of a mystery cube challenge that millions of viewers like to watch on a popular cookery show. I had a quarter cup of glutenious rice flour, half cup of popcorn kernels and white rice to use up. There were vegetables that were looking sad but they were made into soup which was eaten and frozen. I just realized that in less than twelve months, of scrimping and saving, and avoiding coffee shops but not coffee, I have paid off nearly a third of my University debt. Admittedly, our debts are lower in Australia than in the US. The cost to study anywhere is increasing at an alarming rate and the next budget proposes likely increases again. It makes no sense that our government is proposing placing yet more burden on young people and students who have the least of any cohort in the community. We talk about vulnerable people and then go after students and the unemployed with thoughtless insidious enthusiasm. Apparently, people are only vulnerable if they are "hard working families" or "mum and dad investors". I followed the above methods, more or less, and added salt at the end when blending to taste. I also added a dessert spoon of plain yogurt towards the end of the curd making and only brought my mix to the boil (no hotter). It actually looks and tastes quite alright. I added a crushed lactase enzyme tablet to my cheese making mix to make it low lactose. Lactase enzyme drops would be better but there were none available when I went to the pharmacy. Lactese enzyme drops are probably easier to buy online.